I have this in my to do list for long since it is perfect for my low carb diet. Looking at your mac and cheese I am so tempted to try it out right away. Wow! I love this mac and cheese. To bad we have to control our cheese etc intake but will try making a small portion. Super cheesy mac & cheese, that too with cauliflower. Inviting dish to enjoy without any guilt. An intersting way of serving Cauliflower and specially to the kids. The dish looks to tempting. Cauliflower is so versatile and its replacing so many carbs. :) Love this version of mac and cheese. I'm looking forward to your cauliflower creations as I'm quite picky when it comes to cauliflower. 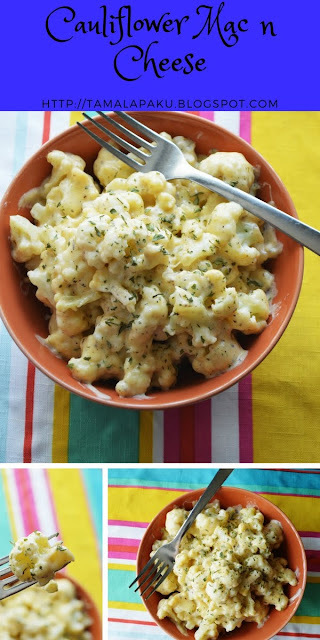 This Mac and cheese version using cauliflower looks very delicious. A delicious way to enjoy cauliflower. This is a fantastic meal on its own Harini, love how creamy this looks!..I too love cooking with cauliflower so looking forward to read your dishes with cauliflower in different ways! I had not heard of cauliflower mac and cheese. What an unique recipe. The source cream/cheese sauce sounds interesting. Love this take on mac and cheese....easy to make for one or many plus adding all that cauliflower! Yum idea...bookmarking! Just the dish I need to use up that big head of cauliflower that has been sleeping in the fridge.What an awesome recipe Harini! Superb! !